Not mine, but I think this explanation is the best I've seen. Also, how many people knew that Grimace was originally a bad guy in McDonaldland but that one time when he was in jail he found Jesus and became a good guy? I've always thought Grimace represented a foodstuff. You know how the other McDonald's characters (Hamburgler, the Fry Guys) represent McDonald's menu items? I posit that Grimace represents whatever odd, mushy substance they really make their food from. Picture it, somewhere, at a hidden mcdonald's lab in the base of some misty volcano, there is an operation not dissimilar to a giant play-doh factory, where shapeless and rubbery purple goo is molded, dyed, and blandly flavored, then left out to dry until it assumes a form more or less convincing enough to pass for whatever it's supposed to be. This would explain the bizarre uniformity of the vegetables, the meat, the buns, the condiments, the fact that you can go to any McDonald's anywhere and order a cheeseburger that tastes exactly like the ones they serve in your hometown. Look at the McDonald's cheese and tell me you disbelieve it could have been a substance akin to silly putty at some point in its life. 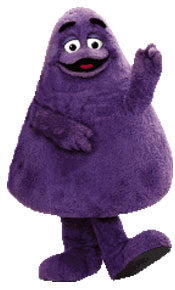 Grimace is the soul of McDonald's, the truth. Ronald McDonald is marketing - a pretty face on the product - Grimace is the evil but clueless, yet oddly borg-like CEO, sitting in some secret office somewhere, guiding the culinary fate of the free world. I approve of your theory, except, I have to spoil it and mention that I believe he represents milkshakes. I guess because he's kind of a giant drop of fat? 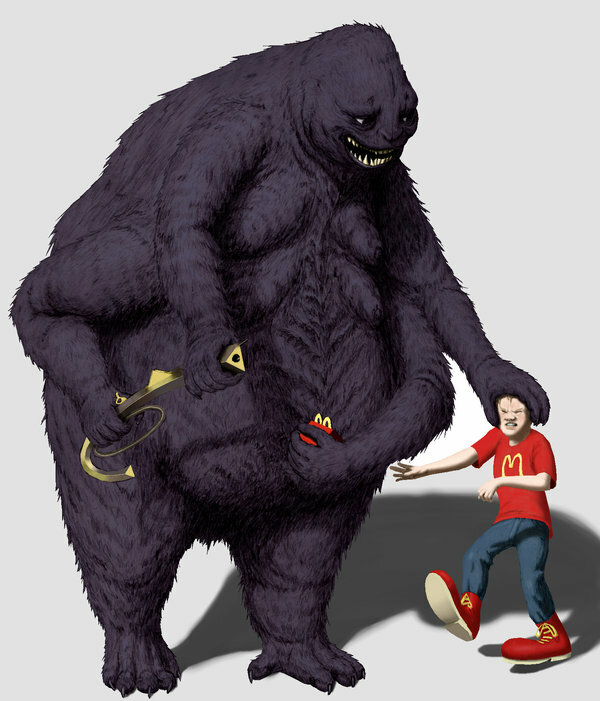 Originally, Grimace was the "Evil Grimace", with two pairs of arms with which to steal milkshakes. After that first campaign, the character was revised to be one of the "good guys", and his number of arms was reduced by two. Instead of swimming out to the ocean and migrating back uphill, why don't salmon just stay home to spawn? I'm guessing that at some point in their evolutionary history, freshwater streams were a much safer haven for their offspring to survive than the open ocean. In fact, I would imagine there was a period in which some did and some didn't, and due to the better offspring survival rate of those that did, those that didn't went the way of the dodo. They're SJs of the fish world, for sure. What about all the successful freshwater species that are nonmigratory? They would probably feel smug if they could. I see salmon as the Navy SEALs of the fish world. The demanding selection process weeds out all but the very toughest before they can spawn. There is a creek just south of Anchorage where the salmon come in from the inlet and are greeted by a small army of fishermen lined up on the banks shoulder to shoulder. Talk about selection pressure. So in general SJs that die early, en masse. Fitting. But does it do much for the bear population? ...Even the losers probably can reel in a few.